The beginning of the end. 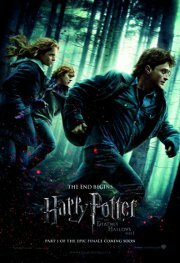 After narrowly escaping to a safe house with his two friends, Harry has to go on the run to avoid being killed. The trio trek around the wilderness after a brief visit to the Ministry of Magic, and spend their time looking for mysterious artifacts needed to defeat Voldemort. Since they are now getting on in years, youthful hormones rush to the surface leading to jealousy and confrontation. All will be revealed in the showdown next year.